Nigerians living in Kenya on Wednesday stormed their High Commission in Nairobi on Wednesday after a student at a local university allegedly died in the hands of Kenyan police. The Nigerian nationals demanded audience with their Ambassador, claiming the deceased was last seen in a police vehicle and later succumbed to injuries they claim were inflicted by law enforcement officers who had arrested him. Speaking to Nairobi News, one of the organisers of the protest who sought anonymity said the United States International University (USIU) student was arrested by police over the weekend for being "in the country legally". The protesters overpowered security guards at the High Commission to gain entry. They said Kenyan police have turned them into cash cows in the ongoing crackdown on illegal immigrants. "They walk in your house and no one is spared. It does not matter whether you have genuine papers or not, they just need your money," said another protester. 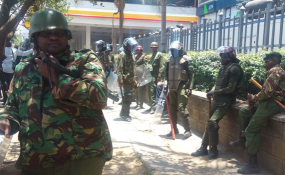 It took the intervention of police officers from Kilimani Police station to calm the situation that threatened to get out of hand as they shouted that Kenyan police were killing them. They said they will hold a similar protest on Thursday until their Ambassador agrees to address their grievances with the Kenyan authorities. Since May when Interior Cabinet Secretary Fred Matiang'i declared a crackdown on illegal immigrants hundreds of undocumented workers have been arrested and deported. An order from Dr Matiang'i indicated that all foreign workers in Kenya must submit proper documents to allow them to continue operating in the country. "Anyone found without valid permits will face different forms of removal including repatriation and deportation," he warned. Foreign workers were then given a 60-day ultimate to present proper documents. According to CS Matiang'i, the country's high unemployment rate is the main reason behind the crackdown on illegal foreign workers in Kenya. "Give me one reason why we need to give a permit to someone coming to be an accountant in Kenya or in the case of civil society, why give a permit to a program officer with the number of graduates who have masters degrees," he posed. Some foreigners have been accused of engaging in criminal activities, which necessitated the operation. According to Matiangi, Kenya spends Sh360 million annually to deport illegal immigrants.